You can’t really tell from the overlook, but there’s a lot to like down in Swamp Canyon. For one, this is part of Bryce Canyon Wilderness, so it is definitely less crowded than the majority of the national park. There are great views of Wightman Bench and Swamp Canyon Butte from down in the canyon. Wildflowers and wildlife are abundant during the green seasons. For a quiet adventure off the beaten path, give Swamp Canyon a try. My brother Dave and I hiked the Swamp Canyon Trail on Sunday, June 3, 2018 beginning at 1:00PM and finishing about 3:00PM. Since we had already done two hikes this day, our plan was to head into Swamp Canyon until we got tired, then return. Hike Rating: Moderate. Not long, but you do have to climb back up out of the canyon. Trail Condition: Mostly good. Trail tread alternates hardpan and sand. Likely to be muddy when wet. There are some roots and rocks to avoid. Stay on the trail. Some areas are recovering from past fires. 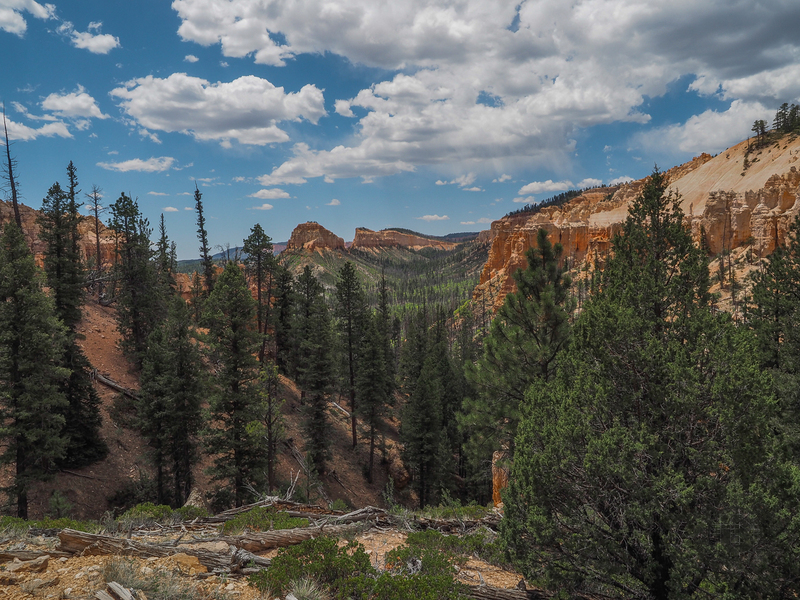 Starting Point: Swamp Canyon Overlook along the main Bryce Canyon Road.. Trail Traffic: We had this trail completely to ourselves despite a busy park. How to Get There: From Ruby’s Inn, UT take Hwy 63 into Bryce Canyon National Park. There is an entrance fee required. Take the park’s main road to Swamp Canyon Overlook, approximately 9 miles. Trailhead is on the left. Topo map of our hike. Click for larger map. After having already hiked Queens Garden and Bristlecone Loop on this day, as the sun warmed the afternoon, we weren’t particularly interested in a long slog down into a canyon. You can do a four and a half mile loop through Swamp Canyon. More than we had in mind, so we decided to just go for awhile, then turn around when we started getting tired. From the overlook on the main park road, Swamp Canyon appears relatively small and sheltered. It’s bounded on both sides by fins and hoodoos, common to most of Bryce Canyon. However, this smaller size allows you to develop a more intimate connection with the landscape than some of the grander viewpoints may provide. The trailhead for this hike is on the north end (left) of the overlook. It is actually two trailheads. There’s the Sheep Creek Trail, a more wandering access to Swamp Canyon that winds through meadows and forest before descending, and the Swamp Canyon Connector Trail, a more direct descent. We chose the latter. The first quarter mile or so takes you through alternating meadow and evergreen forest before reaching the junction where Sheep Creek Trail departs. At the time of our visit in early June, the wildflowers were enjoyable, including blue flax, daisies, clematis and what looked to be a flowering bush in the creosote family. Just before beginning the descent into the canyon, there is a fantastic natural viewing platform between two fins that displays the breadth and depth of Swamp Canyon to the east, and also looks back on the rim behind you. That’s the photo at the top of this post. The view looking east into Swamp Canyon. The descent is through a series of switchbacks, dropping about 700 feet in total. Not far down, there’s a sign that indicates you are entering Bryce Canyon Wilderness, the rugged backcountry region of the national park. When you’re nearing the bottom, the forest becomes more dense, and there is evidence of previous wildfires. Some of the forest is quite stunning, healthy and green, while other portions will take decades to recover from fire. You reach another trail junction, this one where the Connector Trail meets the Swamp Canyon Trail. The forest occasionally opens up providing views of the massive Swamp Canyon Butte standing more than a thousand feet above the canyon level. There are also many of the orange hoodoos that give Bryce Canyon its character. There is scrub oak down in the canyon, at one point growing over and dominating the trail. It is quiet. Really the only sounds are the songbirds. Because of the time of day we didn’t see any wildlife, but there is evidence that there is plenty around. After hiking just over 1.3 miles, we found a nice shady spot on a hill to have a snack, and where Dave could setup for a timelapse video of the puffy white clouds that were beginning to billow above the canyon rim. The hillside was quite sandy, almost like a dune, with flowers and scrub and trees growing. Seemed somewhat out of place amid the giant rock spires of the canyon. After sitting in the shade for 15 minutes, this seemed like a good place to turn around. By now, the afternoon temperature was beginning to rise, and we were becoming a bit leg weary on this our third hike of the day. We took our time on the way back up, seemingly a lot longer than the descent. But isn’t that the way it always is? I don’t know about you, but I much prefer going downhill to going up. Lung capacity and all that. Nearly 8,000′ elevation doesn’t help either. In summary, Swamp Canyon is a nice place to get away from the crowds that encircle the main amphitheater of Bryce Canyon National Park. It is quieter. You may end up like us and have the trail all to yourself. There is some exertion required, but not too bad. 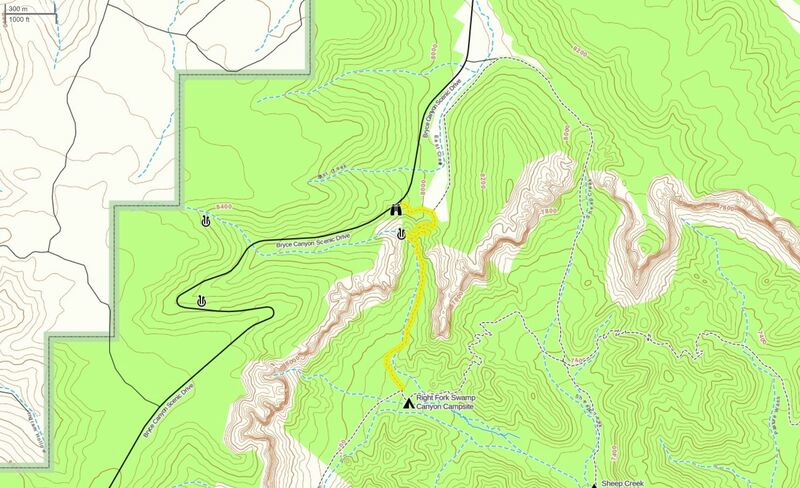 Next time I find myself at Bryce Canyon I would also like to try out the Sheep Creek access into Swamp Canyon.